Davies Auto Care offers the kind of transmission repair cathedral city vehicle owners can depend on. This is because residents of this bustling desert city community tend to brave the harsh desert climate while towing a lot of weight. 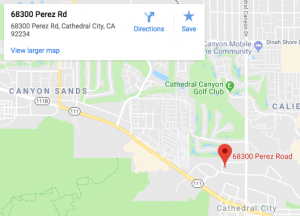 The kind of bustling city and nightlife that Cathedral City people get up to can put a severe strain on their car?s engine, brakes and transmission. Think back to the last time you rode a bike in cathedral city. You started out in a lower gear and shifted to higher gears as you went faster. Down shift for hills, stuff like that. Think of your legs as the engine ? there’s an ideal speed you can pedal and you change gears to leverage the work you’re doing. Lower gears for power on hills or for starting out. Higher gears for more speed. That’s what the automatic transmission does ? it automatically starts in lower gears and shifts up to higher gears to go faster on ca roads. And it automatically shifts back down to climb cathedral city hills, pass or start up again. At Davies Auto Care, we routinely service transmissions with six speeds and several have seven or even eight speeds. As you can imagine, this means more parts. Any they all have to fit into roughly the same space. Contact us today if you need your transmission checked. Transmissions are computer controlled these days, with some high end transmissions having two or three computers. Transmissions are meant to last. But they also have tighter tolerances. If a portion of the transmission requires lubrication, it can lead to failure. Not enough fluid can starve the transmission, or dirty transmission fluid can clog small passages in the transmission. Then the lubricant is blocked and can’t get to all the parts to protect them, so they wear out prematurely. The technicians at Davies Auto Care see far too many transmissions that needlessly failed due to neglect. And, as you can imagine, transmission repair cathedral city drivers experience tend to be costly. That’s why owner?s manuals have a schedule for how often you should change the fluid and what type of fluid to use. It’s really important for cathedral city area drivers to carefully follow the manufacturer’s transmission service schedule. At Davies Auto Care, we hope you never become shiftless just because you didn’t take care of your transmission. Contact Davies Auto Care Inc. for?Transmission Repair in Banning,?Transmission Repair in Beaumont,?Transmission Repair in Bermuda Dunes,?Transmission Repair in Cathedral City,?Transmission Repair in Cherry Valley,?Transmission Repair in Coachella,?Transmission Repair in Coachella Valley,?Transmission Repair in Desert Hot Springs,?Transmission Repair in Indian Wells,?Transmission Repair in Indio,?Transmission Repair in Joshua Tree,?Transmission Repair in La Quinta,?Transmission Repair in Moreno Valley,?Transmission Repair in Morongo Valley,?Transmission Repair in Palm Desert,?Transmission Repair in Palm Springs,?Transmission Repair in Rancho Mirage,?Transmission Repair in Thousand Palms,?Transmission Repair in Twentynine Palms,?Transmission Repair in Yucca Valley, and in surrounding areas.